It is easier to get on the ballot as a candidate in some third world countries than it is in Georgia right now! 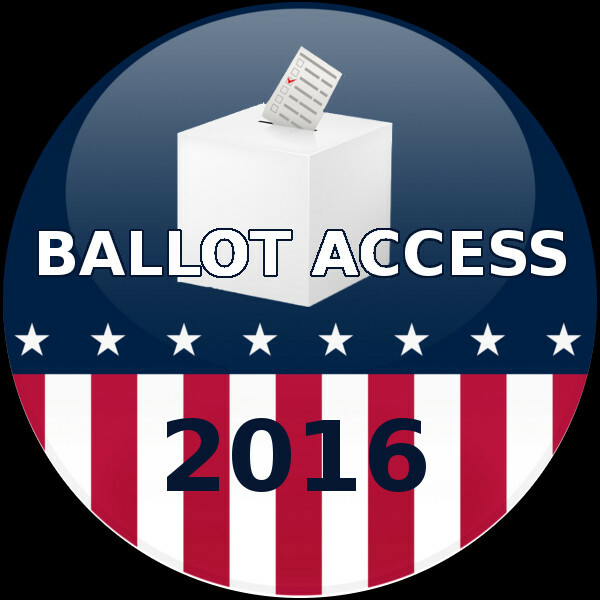 We have some of the toughest ballot access laws in the USA! Currently, to run for State House or State Senate in GA, you must get signatures equal to 5% of registered voters in 180 days. An outrageous number! And this law was passed in 1943!! We have to change this! Help us work to bring true ballot access reform to Georgia. We need open and fair access for all candidates that want to run for office, regardless of party affiliation! ATTN BALLOT ACCESS WARRIORS!! CALL TO ACTION! Here’s the opportunity many of us have been waiting for! We finally have a viable LOCAL candidate trying for LOCAL ballot access in Georgia! Doug King, a successful Second Amendment attorney, is in the process now of gathering signatures to qualify for the Bartow County Commissioner race this November facing incumbent Steve Taylor. Unlike other counties, Bartow County has a sole County Commissioner who acts as the governing authority for the County. As such, this is a unique local race presenting an exceptional opportunity with no Democrat opposition on the ballot this fall. But ballot access advocates must act now! We have a historic opportunity as the legislature convenes in January 2017 to push for changes in local ballot access laws under a March 2016 federal court order by Judge Richard Story. However, if candidates aren’t supported in their efforts to qualify for ballot status, our case for local relief is much harder. Mr. King needs to get the job done FAST and the single best way to get that done is to pay petitioners! Based on the best (but slowest) method of petitioning door to door, Mr. King needs approximately 200 more hours of petitioning in advance of the July qualification deadline. If he can hire 5 people to help for one week, he has the signatures he needs!! He also needs to start collecting funds now to cover the $2,450 qualifying fee that remains to be paid. My personal plea: If we are ever to make inroads in the reform of ballot access laws in Georgia, we absolutely must put our dollars, however limited they may be, to work for the cause of helping Third Party and Independent candidates under the laws as they exist today. Even if you can only set up a $10 weekly auto pay contribution to Mr. King every week or every pay day, please make the effort to do that today. I am putting aside many hours of my time and resources to work on ballot access. All of us that care about having better candidates on Election Day need to take an inventory and understand that ballot access is not going to be obtained through success as Keyboard Warriors or Sideline Cheerleaders. We must make it personal and we need to take action now. Please send your BEST contribution today directly to Mr. King’s account so that funds can be properly allocated and reported under Georgia campaign finance law. Mr. King’s Go Fund Me can be found here: https://www.gofundme.com/dmty366c Note that any funds sent to the Go Fund Me account used for ballot access will not be contributed to Mr. King but will continue to be used to advance the case for ballot reform in Georgia. Thank you in advance for taking personal responsibility to help reform Georgia’s ballot access laws. We need viable and credible local candidates like Doug King qualified on the ballot if we want to see true reform brought to Georgia. This message is not approved by any candidate nor sent in coordination with any campaign. Exciting activity in ballot access! Here's an update of everything going on in this important area of liberty! On April 7, I was on the Fox News radio affiliate in Athens discussing Judge Rick Story's decision reducing the number of signatures necessary to get on the Georgia presidential ballot in 2016. His order cut that number from approximately 50,000 to 7,500. There is also a reality based TV show set to air soon that will conduct an “American Idol” style competition for audience members to select a write in candidate for President. The show could be a watershed moment in popular culture for ballot access. There are also several Libertarian and Independent candidates in multiple counties attempting to obtain signatures for local races in the fall elections. There may be even more!! 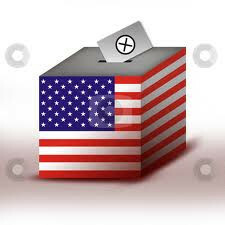 I believe it is important to have resources available to assist ballot access in these efforts this year! 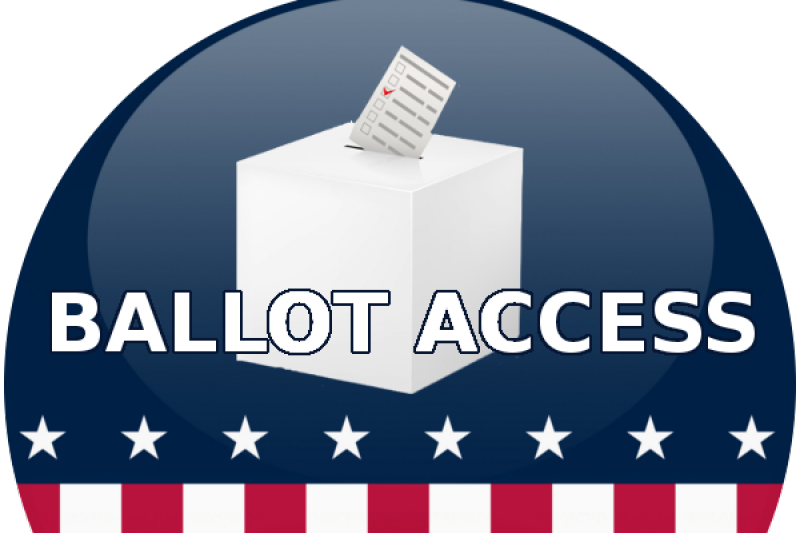 Finally, with the presidential race in full swing and two candidates from outside the structure of the two traditional parties running, now is an excellent time for us to be raising awareness about ballot access. We must also prepare for the work to be done in future legislative sessions. Under Judge Story’s decision, the legislature bears the responsibility for setting the number of “reasonable” signatures for presidential ballot access in Georgia and thus, there will be a good opportunity to work for ballot access in other races during the 2017-2018 session. Or contact me about payment by check. Thank you so much for supporting ballot access efforts in Georgia and beyond. BREAKING NEWS BALLOT ACCESS SUPPORTERS!!! The litigation that has been pending the last four years has finally been decided by Judge Richard Story. I'll be updating everyone with more complete information about the implications of this decision on Georgia's ballot access very soon. This is a favorable ruling for Third Parties and Independents all across Georgia. While this ruling primarily addresses the 2016 Presidential election and ballot access in Georgia, let there be no mistake, the writing is on the wall and with your help we will lead a FULL COURT PRESS on the Georgia legislature to provide voters with down ballot access to every partisan race in Georgia! Thank you to everyone involved with this landmark litigation and most of all to Georgia's ballot access donors who have supported my efforts. The new glassware is in and the back orders are being filled! Over 30 glasses have been sold so these are sure to be H O T items this holiday season! 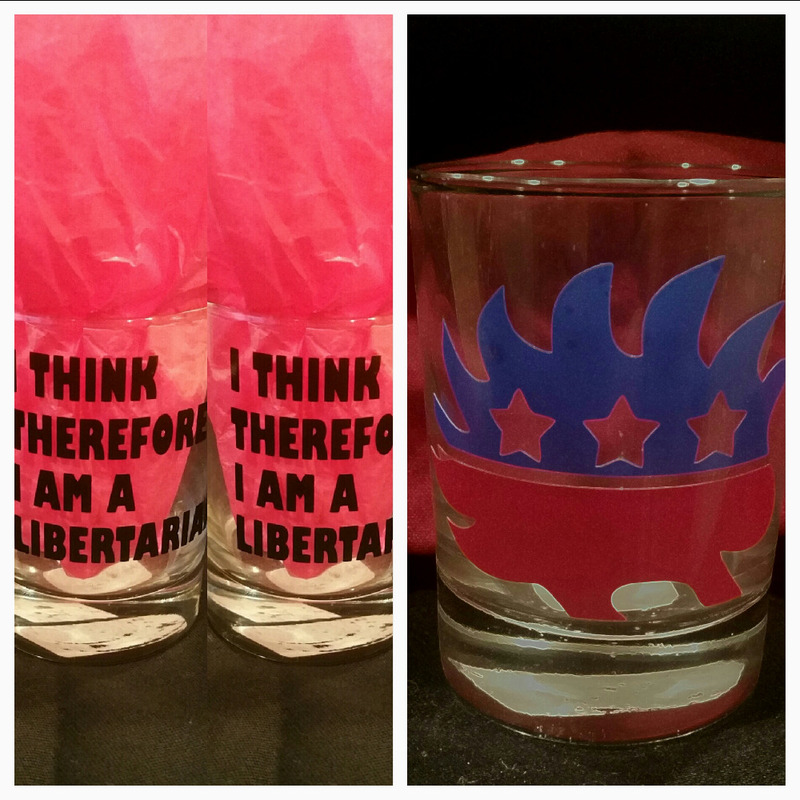 Remember, a $30 donation gets you a set of 2 glasses shipped direct with your choice of the popular and colorful Porcupine symbol or the "I Think, Therefore I am Libertarian" quote. Or mix and match for one of each! For the first time ever, the Libertarian Party of Georgia will be a named sponsor of the Annual Wild Hog Supper which kicks off the Georgia General Assembly session in January. Your support of HB 58, the Georgia ballot access bill, helped make this sponsorship possible! We will start the legislative session off right away by letting representatives and leaders know we are serious about ballot reform this election year. So THANK YOU! Donate now to ensure holiday delivery of your glassware and support ballot access reform in 2016! Our efforts are on the move and we want to see success in 2016!